Over twenty-five degrees yesterday in the greenhouse and a morning spent looking through seed packets making plans for sowing next month. Butternut squash were not a good crop for us last year. They stayed too long in the green house due to a cold early June and when were forced to plant them out to make way for other seedlings they spent the next month flopping around on the ground and generally sulking. In August the foliage became so spectacular that it stretched t o the furthest corners of the front bed up through the apple trees and round the gooseberry bushes. It looked great but we didn’t get even one squash. For those that had more success here is a small assembly based on a fabulous Ottolenghi recipe. Preheat the oven to 220˚C or Gas Mark 7. Peel the squash and cut it in half lengthways. Scoop out the seeds and cut into 2cm chunks. Coat lightly in the olive oil and place in a single layer on a baking sheet. Bake in the oven for 30 to 40 minutes. The squash should be soft and the edges slightly charred. Leave to cool and place on a serving dish. At the same time toast the seeds in the oven for 5 minutes. 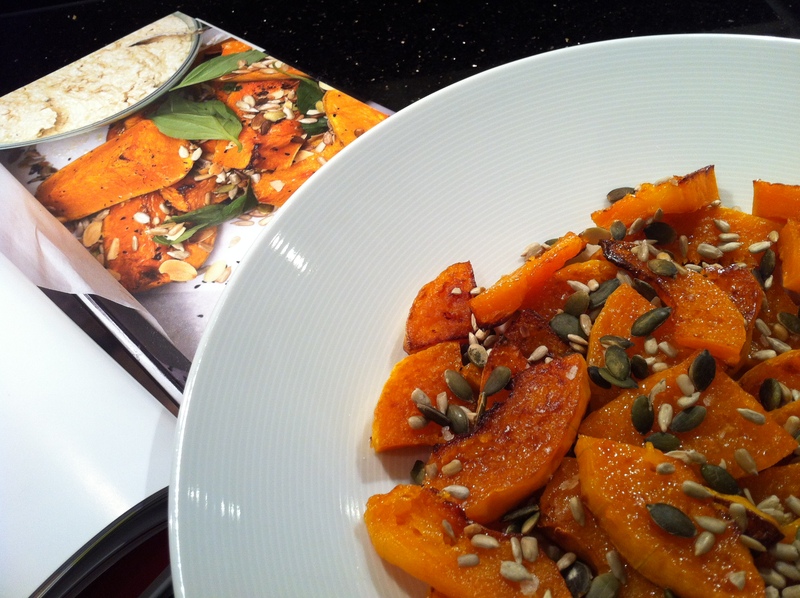 Scatter the squash with the seeds, some Maldon salt and a little bit more olive oil. It would also be nice with a little fresh chilli finely chopped or some fresh parsley or coriander and is best served at room temperature. Great photo and can personally vouch for the taste, very sweet! Must try harder with another crop this year, a bit more nurture perhaps might yield some handsome squashes.